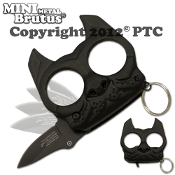 "Brutus the Bulldog" Self Defense Keyring can be attached to keys or easily stowed elsewhere. Made of impact resistant molded plastic that is strong as metal. This keyring will give you the "edge" you need against unwanted advances. Available in many colors, so you can protect yourself in style. Includes a hidden spring assisted opening knife.